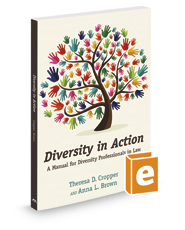 Published by the American Bar Association (ABA), Diversity in Action: A Manual for Diversity Professionals in Law is designed as a resource and educational tool for those performing diversity roles in law firms and corporate legal departments. It is a step-by-step guide to developing, implementing, and managing the functions of diversity and inclusion in an institutional setting. With this manual, you will be able to evaluate and effectively support the way your organization approaches diversity and inclusion initiatives. This user-friendly guide by Theresa D. Cropper and Anna L. Brown is written to assist anyone involved in diversity work. With more than 75 years of combined experience, industry insiders provide the tools necessary for the diversity initiatives to run smoothly in your law firm or corporation.